As far as we can tell, mod-sponge Mount & Blade is seriously lacking in the zombie-themed anime-homage niche. 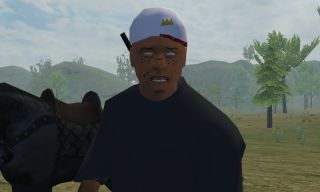 Modder "xPearse" aims to fix that problem with his High School of the Dead project filling TaleWorlds' battlefields with slavering, shambling corpses as a tribute to the popular anime/manga series of the same name. Developed as a one-man effort, HOTD recreates scenes and locations from the Japanese comic and tasks players with leading a band of survivors against the zombie sensation sweeping the nation. The majority of the mod's assets remain heavily work-in-progress, but xPearse hopes for a release next year. Apart from the always-cool prospect of gunning down a mindless zombie charge on serene, rolling plains, HOTD's source material is one of the more popular action series capitalizing on the popular mixture of undead, giant guns, and eternally befuddled male protagonists.